The Caser Group has almost 70 years experience in the Spanish insurance market with other offshoots in the group such as Caser pensions. 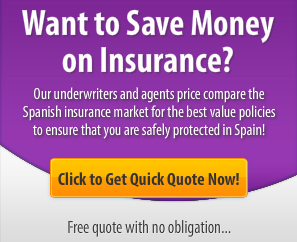 It it is one of the largest and best known Spanish insurance company. Caser Insurance has sold it’s car insurance in Spain for over 60 years, mainly through savings banks but it also has the support of an extensive network of insurance brokers. Caser auto insurance is a good choice for those who value the good level of coverage and personalized service over and above taking out an insurance policy based on price alone. One of the highlights is that Caser, unlike most other car and motor insurers accept drivers under 25 years. Caser Home (Caser Hogar) is the way to protect yourself, your family and home from potential problems and with the best value for money on the market. “In Caser know that often the best of life is to stay home. That’s why we created Caser Home, the insurance that gives you the most comprehensive coverage with the best quality and price in the market. Because so much for you as for us, there’s no place like home. Innovative coverage – legal protection, breakdown of appliances, all new material risk as travel assistance and computer support (data recovery). Damage to trees, shrubs, garden, plants, lawns from fire, explosion, lightning and wind. Limits on liability and damages tailored to the needs of each client and their home. Caser Health offers you the very best in private health care in Spain: forget about waiting lists, and choose a doctor and hospital from a selection of 40,000 specialists and 1,150 clinics. Because when it comes to your health, we do not take any chances. Caser Insurance also offer the following services in Spain: life insurance, funeral insurance, pet insurance and motorcycle insurance. Home: 902 366 505. Open 24-hours. Retail and Real Estate: 902 454 595. Open 24-hours. Deaths: 902 158 198. Open 24-hours. If you have any reviews of Caser Insurance (Caser Seguros) we would love to hear your opinions and experiences in order that this might help new customers who are thinking of taking out an insurance policy with Caser in Spain. we hope this comment may reach the desk of someone to help…. My nsurance expired 10th april 2015, i renewed and paid in full for the following 12 months, at the ime i explained that i had to travel to France on 14th april 2015 they assured me the necessary Green Card would be with me in time for my journey. Dispite several phone calls to which I was promised it would be with me in time for my trip to France. I had to hire a car for my trip witch cost me almost the same price as my 12 months Insurance cover. Now it is 2016 and the same thing is happening Caser assured my agent by phone and in writing, on 30th March 2016 they would post the necessary Green card to be wth me in time for my French trip on 14th April as of today 10 days later it is stll not with me. so now i think i must secure a hire car again this year. next year i will find a new insurance company an i would suggest to any one thinking of insuring with Caser to give it serious thought, they are not reliable. Check Steve Claytons review, March 24th 2016. We have had our car insurance with Caser for the last 4 years; paying by 2 installments a year. Last week we made an online application for booking ITV and it was rejected. We couldn’t understand why; we had our insurance papers and all was up to date so we phoned Caser for any information. We have not received anything from Caser (letter. email, phone call) re their reasons (if any) for cancelling and were told she would have to pass the query to another department and it might take a week and that we should not drive the car.